As one of Ontario’s premier lakeside resorts, Severn Lodge has been hosting memorable and romantic weddings for nearly a century. Long enough to have fine-tuned the itinerary and weekend so that all of the variables that can cause things to go awry have been removed. Take the stress out of planning and trust our process, it works! This allows you to focus on having a good time with friends and family! Located in the heart of the world famous Muskoka ~ Georgian Bay Lake District, Severn Lodge is nestled along the picturesque shores of Gloucester Pool, part of the historic Trent Severn Waterway. The resort encompasses over 2000 feet of private shoreline, is surrounded by hundreds of acres of pristine woodlands, and has a breathtaking view of numerous pine clad islands and sheltered bays. 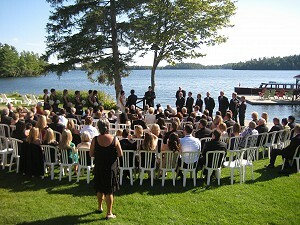 Severn Lodge offers you a very magical setting for a romantic Ontario resort wedding weekend. Our spectacular views and unique location, coupled with the privacy of having the entire resort dedicated only to your wedding, will provide you and your guests with a very unique experience. You deserve the luxury of exclusive use! This allows for complete focus from our entire team; front desk to room attendants. Your guests will surely leave with many fond memories that will last a lifetime. There is nothing more romantic than being married at a beautiful Muskoka resort, and what could be better than to have the bride and bridal party arrive at our main dock for the wedding ceremony in our classic 37’ Ditchburn mahogany motor launch. This vintage craft was originally built in 1922 for Lady Eaton, wife of Sir Timothy Eaton and founder of the Eaton Department Stores. Severn Lodge has owned it since 1946. Your guests will not only be attending your wedding, but they will also be enjoying a fun-filled Ontario resort getaway. They will be able to take advantage of a host of recreation facilities including canoes, pedal boats, stand-up paddle boards, kayaks, mountain bikes, tennis, volleyball, horseshoes, shuffleboard, basketball, 100 acres of wooded hiking trails, games room, heated pool & hot tub, sandy beach and lake swimming, fishing, water park with 25′ trampoline & climbing pyramid, outboard boat & jet-ski rentals, and more! Other recreational options include golf at one of several area courses, horseback riding at a nearby stable, or water-skiing & tubing right off our front dock. As one of the few remaining traditional Ontario resorts, Severn Lodge is steeped in the history of both Ontario resorts and the grand Muskoka resorts of yesteryear. We like to say that we’ve been perfecting the art of hospitality by enchanting our guests with the best in atmosphere, accommodation, recreation, food and service. So, come and relax, let us help you with all of the details of your special day. Your family and friends will be in awe of your choice of venue.